Pictured above, from left to right: Sarah Thorpe Victor Feldman and Mary Guickan. Readers of NewsFour will be familiar with the poet Mary Guckian, whose verses have been featured in our pages before, and who was one of our Poets in Profile in 2014. This year, Mary’s words have lead to the creation of a play by actor, director and playwright Victor Feldman titled A Life. Written in the form of a play for radio, A Life is scripted with parts for six actors. 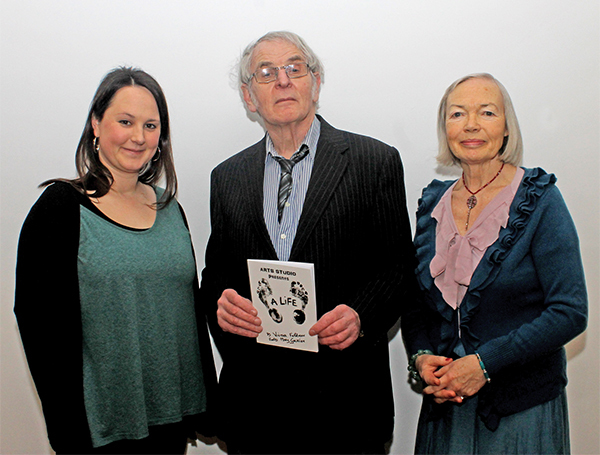 The first public performance took place in the Irish Writer’s Centre on February 16th. This event was also a wine reception and the official launch of the print edition of the play, published by Swan Press. NewsFour was on the scene for the run-up to the second performance of A Life at the Pearse St. library on Wednesday March 18th. Afterwards, we spoke with Victor to see how he felt things had gone and how the play had been received so far. Asked about the origin of A Life, Victor said he would give the brief version of a long story: “I began writing this about 17 or 18 years ago. It’s a bit embarrassing really. We nearly had to brush the cobwebs off the manuscript. We were going through things in the attic and found a lot of Mary’s long-lost poetry. A Life is a play for the ear as well as the eye and worth a look for anyone who has a soft spot for radio drama or the theatre. The print edition of A Life is published by Swan Press and is available at Books on the Green.